Designed for quick, safe, secure fastening for a variety of jobs in poured concrete, brick, cinder block/masonry. Provides self-threading action/maximum holding power for fastening conduit clips; junction boxes; wall partitions/insulation; window/door frames; gutters/roof flashing; shelving; cabinets; furring strips; expansion joints; stud track; duck strap; joist hangers/signs. Designed for quick, safe, secure fastening for a variety of jobs in poured concrete, brick, cinder block/masonry. Provides self-threading action/maximum holding power for fastening conduit clips; junction boxes; wall partitions/insulation; window/door frames; gutters/roof flashing; shelving; cabinets; furring strips; expansion joints; stud track; duck strap; joist hangers/signs. Can be used in all types of hollow material. Designed to connect two pieces of threaded rod. UNC coarse thread sizes. Corrosion-resistant galvanized finish. Made of resistant nylon with wings that expand behind drywall. Corrosion resistant. Designed for quick, safe, secure fastening for a variety of jobs in poured concrete, brick, cinder block/masonry. 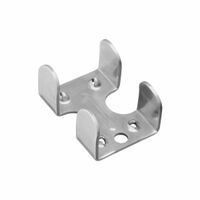 Provides self-threading action/maximum holding power for fastening conduit clips; junction boxes; wall partitions/insulation; window/door frames; gutters/roof flashing; shelving; cabinets; furring strips; expansion joints; stud track; duck strap; joist hangers/signs. Can be used in all types of hollow material. K & S Music Wire, 3/32 in Wire, 36 ft Length, Spring Steel, ASTM A228, 274000 - 303000 psi Tensile Can be used in all types of hollow material. Can be used in all types of hollow material. 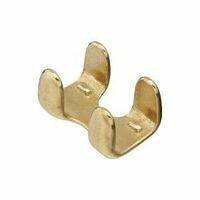 National Hardware Rope Clamp, Non-Magnetic, Series: 3235BC, 150 lb Working Load, 7/16 - 1/2 in, Solid Brass, Solid Brass, For Marine and Other Outdoor Applications Can be used in all types of hollow material. Can be used in all types of hollow material. Designed for quick, safe, secure fastening for a variety of jobs in poured concrete, brick, cinder block/masonry. Provides self-threading action/maximum holding power for fastening conduit clips; junction boxes; wall partitions/insulation; window/door frames; gutters/roof flashing; shelving; cabinets; furring strips; expansion joints; stud track; duck strap; joist hangers/signs. Designed for maximum holding power. Made of high grade steel with special corrosion resistant coating. Bonus: Drill bit included in 10 piece packs. ACQ compatible. Used for joining threaded rods. Designed for maximum holding power. Made of high grade steel with special corrosion resistant coating. Bonus: Drill bit included in 10 piece packs. ACQ compatible. Designed for quick, safe, secure fastening for a variety of jobs in poured concrete, brick, cinder block/masonry. Provides self-threading action/maximum holding power for fastening conduit clips; junction boxes; wall partitions/insulation; window/door frames; gutters/roof flashing; shelving; cabinets; furring strips; expansion joints; stud track; duck strap; joist hangers/signs. Designed for quick, safe, secure fastening for a variety of jobs in poured concrete, brick, cinder block/masonry. Provides self-threading action/maximum holding power for fastening conduit clips; junction boxes; wall partitions/insulation; window/door frames; gutters/roof flashing; shelving; cabinets; furring strips; expansion joints; stud track; duck strap; joist hangers/signs. Made of resistant nylon with wings that expand behind drywall. Corrosion resistant. Designed for maximum holding power. Made of high grade steel with special corrosion resistant coating. Bonus: Drill bit included in 10 piece packs. ACQ compatible. Corrosion resistant, high and low thread for installation and maximum holding power. Bonus: Drill bit included in 10 piece packs, combined head (Robertson & Philips). ACQ compatible. Corrosion resistant, high and low thread for installation and maximum holding power. Bonus: Drill bit included in 10 piece packs, combined head (Robertson & Philips). ACQ compatible. Designed for quick, safe, secure fastening for a variety of jobs in poured concrete, brick, cinder block/masonry. 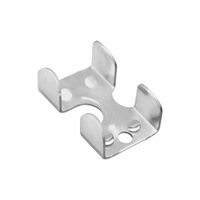 Provides self-threading action/maximum holding power for fastening conduit clips; junction boxes; wall partitions/insulation; window/door frames; gutters/roof flashing; shelving; cabinets; furring strips; expansion joints; stud track; duck strap; joist hangers/signs. Used for joining threaded rods. Designed for maximum holding power. Made of high grade steel with special corrosion resistant coating. Bonus: Drill bit included in 10 piece packs. ACQ compatible. Corrosion resistant, high and low thread for installation and maximum holding power. Bonus: Drill bit included in 10 piece packs, combined head (Robertson & Philips). ACQ compatible. Designed for quick, safe, secure fastening for a variety of jobs in poured concrete, brick, cinder block/masonry. Provides self-threading action/maximum holding power for fastening conduit clips; junction boxes; wall partitions/insulation; window/door frames; gutters/roof flashing; shelving; cabinets; furring strips; expansion joints; stud track; duck strap; joist hangers/signs. Designed for quick, safe, secure fastening for a variety of jobs in poured concrete, brick, cinder block/masonry. Provides self-threading action/maximum holding power for fastening conduit clips; junction boxes; wall partitions/insulation; window/door frames; gutters/roof flashing; shelving; cabinets; furring strips; expansion joints; stud track; duck strap; joist hangers/signs. Designed for maximum holding power. Made of high grade steel with special corrosion resistant coating. Bonus: Drill bit included in 10 piece packs. ACQ compatible. Corrosion resistant, high and low thread for installation and maximum holding power. Bonus: Drill bit included in 10 piece packs, combined head (Robertson & Philips). ACQ compatible. The new FLIPTOGGLE supplies extra holding power in drywall/masonry material with its strong toggling mechanism. Easy and fast to install, this new product provides extra strength in thicker wall material. This simple mechanism ensures perfect installation every time. Twice as strong as the regular toggle bolt with same bolt diameter, the FLIPTOGGLE requires only 1/2" hole and can be used with any bolt length. The flipping action combined with the tilting of its metal toggle offers a trouble-free installation. The new FLIPTOGGLE supplies extra holding power in drywall/masonry material with its strong toggling mechanism. Easy and fast to install, this new product provides extra strength in thicker wall material. This simple mechanism ensures perfect installation every time. Twice as strong as the regular toggle bolt with same bolt diameter, the FLIPTOGGLE requires only 1/2" hole and can be used with any bolt length. The flipping action combined with the tilting of its metal toggle offers a trouble-free installation. Designed for maximum holding power. Made of high grade steel with special corrosion resistant coating. Bonus: Drill bit included in 10 piece packs. ACQ compatible. Corrosion resistant, high and low thread for installation and maximum holding power. Bonus: Drill bit included in 10 piece packs, combined head (Robertson & Philips). ACQ compatible. Corrosion resistant, high and low thread for installation and maximum holding power. Bonus: Drill bit included in 10 piece packs, combined head (Robertson & Philips). ACQ compatible. Designed for maximum holding power. Made of high grade steel with special corrosion resistant coating. Bonus: Drill bit included in 10 piece packs. ACQ compatible. Designed for maximum holding power. Made of high grade steel with special corrosion resistant coating. Bonus: Drill bit included in 10 piece packs. ACQ compatible. Corrosion resistant, high and low thread for installation and maximum holding power. Bonus: Drill bit included in 10 piece packs, combined head (Robertson & Philips). ACQ compatible. Secure attachment to concrete, block and brick. One piece design requires no assembly, does not require anchor torque-down, cracked and seismic approved. Blue ClimaSeal adds corrosion resistance. ANSI drill bit required. Secure attachment to concrete, block and brick. One piece design requires no assembly, does not require anchor torque-down, cracked and seismic approved. Blue ClimaSeal adds corrosion resistance. ANSI drill bit required. Designed for maximum holding power. Made of high grade steel with special corrosion resistant coating. Bonus: Drill bit included in 10 piece packs. ACQ compatible. Corrosion resistant, high and low thread for installation and maximum holding power. Bonus: Drill bit included in 10 piece packs, combined head (Robertson & Philips). ACQ compatible. High grade steel, corrosion resistant, high and low thread for ease of installation and maximum holding power. ACQ compatible. Phillips and Robertson compatible. High grade steel, corrosion resistant, high and low thread for ease of installation and maximum holding power. ACQ compatible. Corrosion resistant, high and low thread for installation and maximum holding power. Bonus: Drill bit included in 10 piece packs, combined head (Robertson & Philips). ACQ compatible. Corrosion resistant, high and low thread for installation and maximum holding power. Bonus: Combined head driver (Robertson & Phillips) drill bit included in 25 and 100 piece packs. Secure attachment to concrete, block and brick. One piece design requires no assembly, does not require anchor torque-down, cracked and seismic approved. Blue ClimaSeal adds corrosion resistance. ANSI drill bit required. Corrosion resistant, high and low thread for installation and maximum holding power. Bonus: Combined head driver (Robertson & Phillips) drill bit included in 25 and 100 piece packs. Designed for maximum holding power. Made of high grade steel with special corrosion resistant coating. Socket drive and drill bit are included as a bonus in all packs of 25 and 100 pieces. Designed for maximum holding power. Made of high grade steel with special corrosion resistant coating. Socket drive and drill bit are included as a bonus in all packs of 25 and 100 pieces. Hardened steel, diamond point. Designed for quick, secure fastening for a variety of jobs in poured concrete, brick and cinder block/masonry. Diamond point provides self-threading, maximum holding power for fastening conduit clips, furring strips, junction boxes, expansion joints, wall partitions/insulation, stud track, window/door frames, duct strap, gutters, joist hangers, shelves, signs and cabinets. Corrosion resistant, high and low thread for installation and maximum holding power. Bonus: Combined head driver (Robertson & Phillips) drill bit included in 25 and 100 piece packs. Phillips and Robertson compatible. High grade steel, corrosion resistant, high and low thread for ease of installation and maximum holding power. ACQ compatible. High grade steel, corrosion resistant, high and low thread for ease of installation and maximum holding power. ACQ compatible. Corrosion resistant, high and low thread for installation and maximum holding power. Bonus: Combined head driver (Robertson & Phillips) drill bit included in 25 and 100 piece packs. Hardened steel, diamond point. Designed for quick, secure fastening for a variety of jobs in poured concrete, brick and cinder block/masonry. Diamond point provides self-threading, maximum holding power for fastening conduit clips, furring strips, junction boxes, expansion joints, wall partitions/insulation, stud track, window/door frames, duct strap, gutters, joist hangers, shelves, signs and cabinets. Hardened steel, diamond point. Designed for quick, secure fastening for a variety of jobs in poured concrete, brick and cinder block/masonry. Diamond point provides self-threading, maximum holding power for fastening conduit clips, furring strips, junction boxes, expansion joints, wall partitions/insulation, stud track, window/door frames, duct strap, gutters, joist hangers, shelves, signs and cabinets. Blue. Hardened steel, diamond point. Designed for quick, secure fastening for a variety of jobs in poured concrete, brick and cinder block/masonry. Diamond point provides self-threading, maximum holding power for fastening conduit clips, furring strips, junction boxes, expansion joints, wall partitions/insulation, stud track, window/door frames, duct strap, gutters, joist hangers, shelves, signs and cabinets. Hardened steel, diamond point. Designed for quick, secure fastening for a variety of jobs in poured concrete, brick and cinder block/masonry. Diamond point provides self-threading, maximum holding power for fastening conduit clips, furring strips, junction boxes, expansion joints, wall partitions/insulation, stud track, window/door frames, duct strap, gutters, joist hangers, shelves, signs and cabinets. Blue. Hardened steel, diamond point. Designed for quick, secure fastening for a variety of jobs in poured concrete, brick and cinder block/masonry. Diamond point provides self-threading, maximum holding power for fastening conduit clips, furring strips, junction boxes, expansion joints, wall partitions/insulation, stud track, window/door frames, duct strap, gutters, joist hangers, shelves, signs and cabinets. Hardened steel, diamond point. Designed for quick, secure fastening for a variety of jobs in poured concrete, brick and cinder block/masonry. Diamond point provides self-threading, maximum holding power for fastening conduit clips, furring strips, junction boxes, expansion joints, wall partitions/insulation, stud track, window/door frames, duct strap, gutters, joist hangers, shelves, signs and cabinets. Blue. Hardened steel, diamond point. Designed for quick, secure fastening for a variety of jobs in poured concrete, brick and cinder block/masonry. Diamond point provides self-threading, maximum holding power for fastening conduit clips, furring strips, junction boxes, expansion joints, wall partitions/insulation, stud track, window/door frames, duct strap, gutters, joist hangers, shelves, signs and cabinets. Blue. Hardened steel, diamond point. Designed for quick, secure fastening for a variety of jobs in poured concrete, brick and cinder block/masonry. Diamond point provides self-threading, maximum holding power for fastening conduit clips, furring strips, junction boxes, expansion joints, wall partitions/insulation, stud track, window/door frames, duct strap, gutters, joist hangers, shelves, signs and cabinets. Hardened steel, diamond point. Designed for quick, secure fastening for a variety of jobs in poured concrete, brick and cinder block/masonry. Diamond point provides self-threading, maximum holding power for fastening conduit clips, furring strips, junction boxes, expansion joints, wall partitions/insulation, stud track, window/door frames, duct strap, gutters, joist hangers, shelves, signs and cabinets. Hardened steel, diamond point. Designed for quick, secure fastening for a variety of jobs in poured concrete, brick and cinder block/masonry. Diamond point provides self-threading, maximum holding power for fastening conduit clips, furring strips, junction boxes, expansion joints, wall partitions/insulation, stud track, window/door frames, duct strap, gutters, joist hangers, shelves, signs and cabinets. Blue. Secure attachment to concrete, block and brick. One piece design requires no assembly, does not require anchor torque-down, cracked and seismic approved. Blue ClimaSeal adds corrosion resistance. ANSI drill bit required. Hardened steel, diamond point. Designed for quick, secure fastening for a variety of jobs in poured concrete, brick and cinder block/masonry. Diamond point provides self-threading, maximum holding power for fastening conduit clips, furring strips, junction boxes, expansion joints, wall partitions/insulation, stud track, window/door frames, duct strap, gutters, joist hangers, shelves, signs and cabinets. Corrosion resistant, high and low thread for installation and maximum holding power. Bonus: Combined head driver (Robertson & Phillips) drill bit included in 25 and 100 piece packs. Designed for maximum holding power. Made of high grade steel with special corrosion resistant coating. Socket drive and drill bit are included as a bonus in all packs of 25 and 100 pieces. Hardened steel, diamond point. Designed for quick, secure fastening for a variety of jobs in poured concrete, brick and cinder block/masonry. Diamond point provides self-threading, maximum holding power for fastening conduit clips, furring strips, junction boxes, expansion joints, wall partitions/insulation, stud track, window/door frames, duct strap, gutters, joist hangers, shelves, signs and cabinets. Blue. Corrosion resistant, high and low thread for installation and maximum holding power. Bonus: Combined head driver (Robertson & Phillips) drill bit included in 25 and 100 piece packs. Hardened steel, diamond point. Designed for quick, secure fastening for a variety of jobs in poured concrete, brick and cinder block/masonry. Diamond point provides self-threading, maximum holding power for fastening conduit clips, furring strips, junction boxes, expansion joints, wall partitions/insulation, stud track, window/door frames, duct strap, gutters, joist hangers, shelves, signs and cabinets. Blue. Hardened steel, diamond point. Designed for quick, secure fastening for a variety of jobs in poured concrete, brick and cinder block/masonry. Diamond point provides self-threading, maximum holding power for fastening conduit clips, furring strips, junction boxes, expansion joints, wall partitions/insulation, stud track, window/door frames, duct strap, gutters, joist hangers, shelves, signs and cabinets. Designed for maximum holding power. Made of high grade steel with special corrosion resistant coating. Socket drive and drill bit are included as a bonus in all packs of 25 and 100 pieces. Can be used in all types of hollow material. Designed for maximum holding power. Made of high grade steel with special corrosion resistant coating. Socket drive and drill bit are included as a bonus in all packs of 25 and 100 pieces. Hardened steel, diamond point. Designed for quick, secure fastening for a variety of jobs in poured concrete, brick and cinder block/masonry. Diamond point provides self-threading, maximum holding power for fastening conduit clips, furring strips, junction boxes, expansion joints, wall partitions/insulation, stud track, window/door frames, duct strap, gutters, joist hangers, shelves, signs and cabinets. K & S Music Wire, 3/16 in Wire, 36 ft Length, Steel, ASTM A228 Corrosion resistant, high and low thread for installation and maximum holding power. Bonus: Combined head driver (Robertson & Phillips) drill bit included in 25 and 100 piece packs. Designed for maximum holding power. Made of high grade steel with special corrosion resistant coating. Socket drive and drill bit are included as a bonus in all packs of 25 and 100 pieces. For keyed exterior doors. Both bell-shaped knobs lock or unlock by key outside or turnbutton inside. DOOR PREP: 2-1/8" Cross Bore, 1" Edge Bore, 1" x 2-1/4" Latch Face. BACKSET: 2-3/8" standard and adjustable 2-3/8" and 2-3/4" optional. DOOR THICKNESS: 1-3/8" to 1-3/4" . CYLINDER: 5-pin. FACEPLATES: 1" x 2-1/4" round corner. STRIKES: 2-1/4" full lip round corner. BOLT: 1/2" throw. HANDING: Reversible for right or left hand doors. ANSI/BHMA: Grade 3. Corrosion resistant, high and low thread for installation and maximum holding power. Bonus: Combined head driver (Robertson & Phillips) drill bit included in 25 and 100 piece packs. The new FLIPTOGGLE supplies extra holding power in drywall/masonry material with its strong toggling mechanism. Easy and fast to install, this new product provides extra strength in thicker wall material. This simple mechanism ensures perfect installation every time. Twice as strong as the regular toggle bolt with same bolt diameter, the FLIPTOGGLE requires only 1/2" hole and can be used with any bolt length. The flipping action combined with the tilting of its metal toggle offers a trouble-free installation. Designed for maximum holding power. Made of high grade steel with special corrosion resistant coating. Socket drive and drill bit are included as a bonus in all packs of 25 and 100 pieces. The new FLIPTOGGLE supplies extra holding power in drywall/masonry material with its strong toggling mechanism. Easy and fast to install, this new product provides extra strength in thicker wall material. This simple mechanism ensures perfect installation every time. Twice as strong as the regular toggle bolt with same bolt diameter, the FLIPTOGGLE requires only 1/2" hole and can be used with any bolt length. The flipping action combined with the tilting of its metal toggle offers a trouble-free installation. Fast installation. Replaces small diameter expansion anchors, plugs and screws in light to medium duty applications. No need to pre-spot hole. No inserts are required. Reversible and removable. Can be installed close to an edge. Thread design results in increased pullout values and lower installation torque. 'Climaseal' coating provides extra corrosion resistance. Applications: Electrical junction boxes, conduit clips, HVAC strapping, 2 x 4 lumber, wood headers, furring strips, hurricane shutters,window frames, jambs and sills, door frames to masonry, plywood backer boards to masonry, exterior insulation to masonry. Fast installation. Replaces small diameter expansion anchors, plugs and screws in light to medium duty applications. No need to pre-spot hole. No inserts are required. Reversible and removable. Can be installed close to an edge. Thread design results in increased pullout values and lower installation torque. 'Climaseal' coating provides extra corrosion resistance. Applications: Electrical junction boxes, conduit clips, HVAC strapping, 2 x 4 lumber, wood headers, furring strips, hurricane shutters,window frames, jambs and sills, door frames to masonry, plywood backer boards to masonry, exterior insulation to masonry. K & S Music Wire, 5/32 in Wire, 36 ft Length, Steel High grade steel, corrosion resistant, high and low thread for ease of installation and maximum holding power. ACQ compatible. Secure attachment to concrete, block and brick. One piece design requires no assembly, does not require anchor torque-down, cracked and seismic approved. Blue ClimaSeal adds corrosion resistance. ANSI drill bit required. Designed for maximum holding power. Made of high grade steel with special corrosion resistant coating. Socket drive and drill bit are included as a bonus in all packs of 25 and 100 pieces. Secure attachment to concrete, block and brick. One piece design requires no assembly, does not require anchor torque-down, cracked and seismic approved. Blue ClimaSeal adds corrosion resistance. ANSI drill bit required. For keyed exterior doors. Both knobs lock or unlock by key outside or turnbutton inside. All metal components. Solid steel latch assembly. Rust resistant solid brass keyway for more security. Seamless one-piece knob for extra strength. Square spindle for right or left handed installations. Easy installation. Cylinder drilled for construction keying. DOOR PREP: 2-1/8" Crossbore, 1" Edge Bore, 1" x 2-1/4" Latch Face. DOOR THICKNESS: Fits 1-3/8" to 1-3/4" doors. CYLINDER: 5-pin, removable, KW1 keyway, one piece solid brass; (2) nickel plated, solid brass keys. STRIKES: 1" x 2-1/4". BOLT: 1/2" throw. HANDING: Reversible for right or left hand doors. ANSI/BHMA: Exceeds Grade 3 Standards. 6-WAY ADJUSTABLE LATCH: Fits 2-3/8" to 2-3/4" square corner, radius corner, or drive-in applications; includes both square and 1/4" radius corner strikes. Phillips and Robertson compatible. High grade steel, corrosion resistant, high and low thread for ease of installation and maximum holding power. ACQ compatible. Fast installation. Replaces small diameter expansion anchors, plugs and screws in light to medium duty applications. No need to pre-spot hole. No inserts are required. Reversible and removable. Can be installed close to an edge. Thread design results in increased pullout values and lower installation torque. 'Climaseal' coating provides extra corrosion resistance. Applications: Electrical junction boxes, conduit clips, HVAC strapping, 2 x 4 lumber, wood headers, furring strips, hurricane shutters,window frames, jambs and sills, door frames to masonry, plywood backer boards to masonry, exterior insulation to masonry. Fast installation. Replaces small diameter expansion anchors, plugs and screws in light to medium duty applications. No need to pre-spot hole. No inserts are required. Reversible and removable. Can be installed close to an edge. Thread design results in increased pullout values and lower installation torque. 'Climaseal' coating provides extra corrosion resistance. Applications: Electrical junction boxes, conduit clips, HVAC strapping, 2 x 4 lumber, wood headers, furring strips, hurricane shutters,window frames, jambs and sills, door frames to masonry, plywood backer boards to masonry, exterior insulation to masonry. Designed for maximum holding power. Made of high grade steel with special corrosion resistant coating. Socket drive and drill bit are included as a bonus in all packs of 25 and 100 pieces. Corrosion resistant, high and low thread for installation and maximum holding power. Bonus: Combined head driver (Robertson & Phillips) drill bit included in 25 and 100 piece packs. Designed for maximum holding power. Made of high grade steel with special corrosion resistant coating. Socket drive and drill bit are included as a bonus in all packs of 25 and 100 pieces. Corrosion resistant, high and low thread for installation and maximum holding power. Bonus: Combined head driver (Robertson & Phillips) drill bit included in 25 and 100 piece packs. Easy installation; fits all standard door preparations; keyed entry function; turn button locking, can be unlocked by key outside or by turn button inside; can be rekeyed to match existing locks or other locks purchased. Easy installation; fits all standard door preparations; keyed entry function; turn button locking, can be unlocked by key outside or by turn button inside; can be rekeyed to match existing locks or other locks purchased. Phillips and Robertson compatible. High grade steel, corrosion resistant, high and low thread for ease of installation and maximum holding power. ACQ compatible. Corrosion resistant, high and low thread for installation and maximum holding power. Bonus: Combined head driver (Robertson & Phillips) drill bit included in 25 and 100 piece packs. Fast installation. Replaces small diameter expansion anchors, plugs and screws in light to medium duty applications. No need to pre-spot hole. No inserts are required. Reversible and removable. Can be installed close to an edge. Thread design results in increased pullout values and lower installation torque. 'Climaseal' coating provides extra corrosion resistance. Applications: Electrical junction boxes, conduit clips, HVAC strapping, 2 x 4 lumber, wood headers, furring strips, hurricane shutters,window frames, jambs and sills, door frames to masonry, plywood backer boards to masonry, exterior insulation to masonry. Fast installation. Replaces small diameter expansion anchors, plugs and screws in light to medium duty applications. No need to pre-spot hole. No inserts are required. Reversible and removable. Can be installed close to an edge. Thread design results in increased pullout values and lower installation torque. 'Climaseal' coating provides extra corrosion resistance. Applications: Electrical junction boxes, conduit clips, HVAC strapping, 2 x 4 lumber, wood headers, furring strips, hurricane shutters,window frames, jambs and sills, door frames to masonry, plywood backer boards to masonry, exterior insulation to masonry. Used for joining threaded rods. Easy installation; fits all standard door preparations; keyed entry function; turn button locking, can be unlocked by key outside or by turn button inside; can be rekeyed to match existing locks or other locks purchased. Easy installation; fits all standard door preparations; keyed entry function; turn button locking, can be unlocked by key outside or by turn button inside; can be rekeyed to match existing locks or other locks purchased. Corrosion resistant, high and low thread for installation and maximum holding power. Bonus: Combined head driver (Robertson & Phillips) drill bit included in 25 and 100 piece packs. Designed for maximum holding power. Made of high grade steel with special corrosion resistant coating. Socket drive and drill bit are included as a bonus in all packs of 25 and 100 pieces. Designed for maximum holding power. Made of high grade steel with special corrosion resistant coating. Socket drive and drill bit are included as a bonus in all packs of 25 and 100 pieces. Corrosion resistant, high and low thread for installation and maximum holding power. Bonus: Combined head driver (Robertson & Phillips) drill bit included in 25 and 100 piece packs. Fast installation. Replaces small diameter expansion anchors, plugs and screws in light to medium duty applications. No need to pre-spot hole. No inserts are required. Reversible and removable. Can be installed close to an edge. Thread design results in increased pullout values and lower installation torque. 'Climaseal' coating provides extra corrosion resistance. Applications: Electrical junction boxes, conduit clips, HVAC strapping, 2 x 4 lumber, wood headers, furring strips, hurricane shutters,window frames, jambs and sills, door frames to masonry, plywood backer boards to masonry, exterior insulation to masonry. Includes entry lockset and single cylinder deadbolt. Both entry lockset and deadbolt unlock and lock by key outside and turnpiece inside. Adjustable backset: 2-3/8" to 2-3/4". Fits doors up to 1-3/8" to 1-3/4" thick. Full lip 1/4" radius round corner strike. Includes 2 keys, which fit both locks. The new FLIPTOGGLE supplies extra holding power in drywall/masonry material with its strong toggling mechanism. Easy and fast to install, this new product provides extra strength in thicker wall material. This simple mechanism ensures perfect installation every time. Twice as strong as the regular toggle bolt with same bolt diameter, the FLIPTOGGLE requires only 1/2" hole and can be used with any bolt length. The flipping action combined with the tilting of its metal toggle offers a trouble-free installation. Secure attachment to concrete, block and brick. One piece design requires no assembly, does not require anchor torque-down, cracked and seismic approved. Blue ClimaSeal adds corrosion resistance. ANSI drill bit required. Phillips and Robertson compatible. High grade steel, corrosion resistant, high and low thread for ease of installation and maximum holding power. ACQ compatible. Fast installation. Replaces small diameter expansion anchors, plugs and screws in light to medium duty applications. No need to pre-spot hole. No inserts are required. Reversible and removable. Can be installed close to an edge. Thread design results in increased pullout values and lower installation torque. 'Climaseal' coating provides extra corrosion resistance. Applications: Electrical junction boxes, conduit clips, HVAC strapping, 2 x 4 lumber, wood headers, furring strips, hurricane shutters,window frames, jambs and sills, door frames to masonry, plywood backer boards to masonry, exterior insulation to masonry. Fast installation. Replaces small diameter expansion anchors, plugs and screws in light to medium duty applications. No need to pre-spot hole. No inserts are required. Reversible and removable. Can be installed close to an edge. Thread design results in increased pullout values and lower installation torque. 'Climaseal' coating provides extra corrosion resistance. Applications: Electrical junction boxes, conduit clips, HVAC strapping, 2 x 4 lumber, wood headers, furring strips, hurricane shutters,window frames, jambs and sills, door frames to masonry, plywood backer boards to masonry, exterior insulation to masonry. Midwest Toggle Bolt, Round Head, 1/8 in Anchor, 2 in Anchor, Drill Bit Size 3/8 in, Zinc Plated, With Wings Corrosion resistant, high and low thread for installation and maximum holding power. Bonus: Combined head driver (Robertson & Phillips) drill bit included in 25 and 100 piece packs. Designed for maximum holding power. Made of high grade steel with special corrosion resistant coating. Socket drive and drill bit are included as a bonus in all packs of 25 and 100 pieces. For keyed exterior doors. Both bell-shaped knobs lock or unlock by key outside or turnbutton inside. DOOR PREP: 2-1/8" Cross Bore, 1" Edge Bore, 1" x 2-1/4" Latch Face. BACKSET: 2-3/8" standard and adjustable 2-3/8" and 2-3/4" optional. DOOR THICKNESS: 1-3/8" to 1-3/4" . CYLINDER: 5-pin. FACEPLATES: 1" x 2-1/4" round corner. STRIKES: 2-1/4" full lip round corner. BOLT: 1/2" throw. HANDING: Reversible for right or left hand doors. ANSI/BHMA: Grade 3. For keyed exterior doors. Both bell-shaped knobs lock or unlock by key outside or turnbutton inside. DOOR PREP: 2-1/8" Cross Bore, 1" Edge Bore, 1" x 2-1/4" Latch Face. BACKSET: 2-3/8" standard and adjustable 2-3/8" and 2-3/4" optional. DOOR THICKNESS: 1-3/8" to 1-3/4" . CYLINDER: 5-pin. FACEPLATES: 1" x 2-1/4" round corner. STRIKES: 2-1/4" full lip round corner. BOLT: 1/2" throw. HANDING: Reversible for right or left hand doors. ANSI/BHMA: Grade 3. Fast installation. Replaces small diameter expansion anchors, plugs and screws in light to medium duty applications. No need to pre-spot hole. No inserts are required. Reversible and removable. Can be installed close to an edge. Thread design results in increased pullout values and lower installation torque. 'Climaseal' coating provides extra corrosion resistance. Applications: Electrical junction boxes, conduit clips, HVAC strapping, 2 x 4 lumber, wood headers, furring strips, hurricane shutters,window frames, jambs and sills, door frames to masonry, plywood backer boards to masonry, exterior insulation to masonry. Fast installation. Replaces small diameter expansion anchors, plugs and screws in light to medium duty applications. No need to pre-spot hole. No inserts are required. Reversible and removable. Can be installed close to an edge. Thread design results in increased pullout values and lower installation torque. 'Climaseal' coating provides extra corrosion resistance. Applications: Electrical junction boxes, conduit clips, HVAC strapping, 2 x 4 lumber, wood headers, furring strips, hurricane shutters,window frames, jambs and sills, door frames to masonry, plywood backer boards to masonry, exterior insulation to masonry. For keyed exterior doors. Rounded design to proportionally fit the palm of the hand. Both knobs lock or unlock by key outside or turnbutton inside. DOOR PREP: 2-1/8" Cross Bore, 1" Edge Bore, 1" x 2-1/4" Latch Face. BACKSET: 2-3/8" standard and adjustable 2-3/8" and 2-3/4" optional. DOOR THICKNESS: 1-3/8" to 1-3/4"; 2-1/4" doors optional. CYLINDER: 5-pin. FACEPLATES: 1" x 2-1/4" round corner. STRIKES: 2-1/4" full round corner. BOLT: 1/2" throw. HANDING: Reversible for right or left hand doors. ANSI/BHMA: Grade 3. Locksets with "SmartKey" (denoted SMT) feature allows, in 3 steps, locks to be re-keyed to a spare set of keys. When the spare keys are done being used, the lock can be re-keyed back to the original set of keys; can continually be re-keyed. For keyed exterior doors. Rounded design to proportionally fit the palm of the hand. Both knobs lock or unlock by key outside or turnbutton inside. DOOR PREP: 2-1/8" Cross Bore, 1" Edge Bore, 1" x 2-1/4" Latch Face. BACKSET: 2-3/8" standard and adjustable 2-3/8" and 2-3/4" optional. DOOR THICKNESS: 1-3/8" to 1-3/4"; 2-1/4" doors optional. CYLINDER: 5-pin. FACEPLATES: 1" x 2-1/4" round corner. STRIKES: 2-1/4" full round corner. BOLT: 1/2" throw. HANDING: Reversible for right or left hand doors. ANSI/BHMA: Grade 3. Locksets with "SmartKey" (denoted SMT) feature allows, in 3 steps, locks to be re-keyed to a spare set of keys. When the spare keys are done being used, the lock can be re-keyed back to the original set of keys; can continually be re-keyed. For keyed exterior doors. Rounded design to proportionally fit the palm of the hand. Both knobs lock or unlock by key outside or turnbutton inside. DOOR PREP: 2-1/8" Cross Bore, 1" Edge Bore, 1" x 2-1/4" Latch Face. BACKSET: 2-3/8" standard and adjustable 2-3/8" and 2-3/4" optional. DOOR THICKNESS: 1-3/8" to 1-3/4"; 2-1/4" doors optional. CYLINDER: 5-pin. FACEPLATES: 1" x 2-1/4" round corner. STRIKES: 2-1/4" full round corner. BOLT: 1/2" throw. HANDING: Reversible for right or left hand doors. ANSI/BHMA: Grade 3. Locksets with "SmartKey" (denoted SMT) feature allows, in 3 steps, locks to be re-keyed to a spare set of keys. When the spare keys are done being used, the lock can be re-keyed back to the original set of keys; can continually be re-keyed. Used for joining threaded rods. High grade steel, corrosion resistant, high and low thread for ease of installation and maximum holding power. ACQ compatible. Midwest Toggle Bolt, Round Head, 1/8 in Anchor, 3 in Anchor, Drill Bit Size 3/8 in, Zinc Plated, With Wings Corrosion resistant, high and low thread for installation and maximum holding power. Bonus: Combined head driver (Robertson & Phillips) drill bit included in 25 and 100 piece packs. Phillips and Robertson compatible. High grade steel, corrosion resistant, high and low thread for ease of installation and maximum holding power. ACQ compatible. For keyed exterior doors. Both knobs lock or unlock by key outside or turnbutton inside. Features titanium alloy throwbolt core, anti-pick 6 pin system and ultra-strike for jamb brace. DOOR PREP: 2-1/8" Cross Bore, 1" Edge Bore, 1" x 2-1/4" Latch Face. BACKSET: 2-3/8" - 2-3/4" adjustable. DOOR THICKNESS: 1-3/4" doors standard and 2-1/4" doors optional. CYLINDER: 5-pin. FACEPLATES: 1" x 2-1/4" round corner. STRIKE: 2-1/4" full lip. BOLT: 1" throw. Nickel plated. HANDING: Reversible for right or left hand doors. ANSI/BHMA: Grade 2. For keyed exterior doors. Both knobs lock or unlock by key outside or turnbutton inside. Features titanium alloy throwbolt core and ultra-strike for jamb brace. "SmartKey's" patented side locking bar technology replaces the traditional pin-and-tumbler design. This design includes "BumpGuard" for improved security against lock bumping. "SmartKey" allows lock to be rekeyed without removing it from door. DOOR PREP: 2-1/8" Cross Bore, 1" Edge Bore, 1" x 2-1/4" Latch Face. BACKSET: 2-3/8" - 2-3/4" adjustable. DOOR THICKNESS: 1-3/4" doors standard and 2-1/4" doors optional. CYLINDER: 5 pin SmartKey. 5-pin optional. FACEPLATES: 1" x 2-1/4" round corner. STRIKE: 2-1/4" full lip. BOLT: 1" throw. Nickel plated. HANDING: Reversible for right or left hand doors. ANSI/BHMA: Grade 2. Secure attachment to concrete, block and brick. One piece design requires no assembly, does not require anchor torque-down, cracked and seismic approved. Blue ClimaSeal adds corrosion resistance. ANSI drill bit required. Secure attachment to concrete, block and brick. One piece design requires no assembly, does not require anchor torque-down, cracked and seismic approved. Blue ClimaSeal adds corrosion resistance. ANSI drill bit required. Fast installation. Replaces small diameter expansion anchors, plugs and screws in light to medium duty applications. No need to pre-spot hole. No inserts are required. Reversible and removable. Can be installed close to an edge. Thread design results in increased pullout values and lower installation torque. 'Climaseal' coating provides extra corrosion resistance. Applications: Electrical junction boxes, conduit clips, HVAC strapping, 2 x 4 lumber, wood headers, furring strips, hurricane shutters,window frames, jambs and sills, door frames to masonry, plywood backer boards to masonry, exterior insulation to masonry. Designed for maximum holding power. Made of high grade steel with special corrosion resistant coating. Socket drive and drill bit are included as a bonus in all packs of 25 and 100 pieces. Fast installation. Replaces small diameter expansion anchors, plugs and screws in light to medium duty applications. No need to pre-spot hole. No inserts are required. Reversible and removable. Can be installed close to an edge. Thread design results in increased pullout values and lower installation torque. 'Climaseal' coating provides extra corrosion resistance. Applications: Electrical junction boxes, conduit clips, HVAC strapping, 2 x 4 lumber, wood headers, furring strips, hurricane shutters,window frames, jambs and sills, door frames to masonry, plywood backer boards to masonry, exterior insulation to masonry. For keyed exterior doors. Both Colonial style knobs lock or unlock by key outside or turnbutton inside. DOOR PREP: 2-1/8" Cross Bore, 1" Edge Bore, 1" x 2-1/4" Latch Face. BACKSET: 2-3/8" standard and adjustable 2-3/8" and 2-3/4" optional. DOOR THICKNESS: 1-3/8" to 1-3/4"; 2-1/4" doors optional. CYLINDER: 5-pin. FACEPLATES: 1" x 2-1/4" round corner. STRIKES: 2-1/4" full lip round corner. BOLT: 1/2" throw. HANDING: Reversible for right or left hand doors. ANSI/BHMA: Grade 3. For keyed exterior doors. Both Colonial style knobs lock or unlock by key outside or turnbutton inside. DOOR PREP: 2-1/8" Cross Bore, 1" Edge Bore, 1" x 2-1/4" Latch Face. BACKSET: 2-3/8" standard and adjustable 2-3/8" and 2-3/4" optional. DOOR THICKNESS: 1-3/8" to 1-3/4"; 2-1/4" doors optional. CYLINDER: 5-pin. FACEPLATES: 1" x 2-1/4" round corner. STRIKES: 2-1/4" full lip round corner. BOLT: 1/2" throw. HANDING: Reversible for right or left hand doors. ANSI/BHMA: Grade 3. Designed for maximum holding power. Made of high grade steel with special corrosion resistant coating. Socket drive and drill bit are included as a bonus in all packs of 25 and 100 pieces. Secure attachment to concrete, block and brick. One piece design requires no assembly, does not require anchor torque-down, cracked and seismic approved. Blue ClimaSeal adds corrosion resistance. ANSI drill bit required. Midwest Toggle Bolt, Round Head, 3/16 in Anchor, 3 in Anchor, Drill Bit Size 1/2 in, Zinc Plated, With Wings Used for joining threaded rods. For heavy duty concrete and masonry. Zero stripping recessed Star Drive. Aggressive Heavy duty threads lock into concrete. Can be removed and reinserted without screw damage. Countersinking Bugle Head locks wood to concrete for complete installation and effective anchoring. Caliburn PH pan head is ideal for an exposed finished look including installation of electrical boxes. Caliburn XL washer head design for superior holding power. Caliburn XL is code approved under ICC report ESR-3251. Climatek coating is AC257 code approved for use in treated lumber. For keyed exterior doors. Both knobs lock or unlock by key outside or turnbutton inside. Features titanium alloy throwbolt core, anti-pick 6 pin system and ultra-strike for jamb brace. DOOR PREP: 2-1/8" Cross Bore, 1" Edge Bore, 1" x 2-1/4" Latch Face. BACKSET: 2-3/8" - 2-3/4" adjustable. DOOR THICKNESS: 1-3/4" doors standard and 2-1/4" doors optional. CYLINDER: 5-pin. FACEPLATES: 1" x 2-1/4" round corner. STRIKE: 2-1/4" full lip. BOLT: 1" throw. Nickel plated. HANDING: Reversible for right or left hand doors. ANSI/BHMA: Grade 2. Easy installation; fits all standard door preparations; keyed entry function; turn button locking, can be unlocked by key outside or by turn button inside; can be rekeyed to match existing locks or other locks purchased. Easy installation; fits all standard door preparations; keyed entry function; turn button locking, can be unlocked by key outside or by turn button inside; can be rekeyed to match existing locks or other locks purchased. Easy installation; fits all standard door preparations; keyed entry function; turn button locking, can be unlocked by key outside or by turn button inside; can be rekeyed to match existing locks or other locks purchased. Fast installation. Replaces small diameter expansion anchors, plugs and screws in light to medium duty applications. No need to pre-spot hole. No inserts are required. Reversible and removable. Can be installed close to an edge. Thread design results in increased pullout values and lower installation torque. 'Climaseal' coating provides extra corrosion resistance. Applications: Electrical junction boxes, conduit clips, HVAC strapping, 2 x 4 lumber, wood headers, furring strips, hurricane shutters,window frames, jambs and sills, door frames to masonry, plywood backer boards to masonry, exterior insulation to masonry. Fast installation. Replaces small diameter expansion anchors, plugs and screws in light to medium duty applications. No need to pre-spot hole. No inserts are required. Reversible and removable. Can be installed close to an edge. Thread design results in increased pullout values and lower installation torque. 'Climaseal' coating provides extra corrosion resistance. Applications: Electrical junction boxes, conduit clips, HVAC strapping, 2 x 4 lumber, wood headers, furring strips, hurricane shutters,window frames, jambs and sills, door frames to masonry, plywood backer boards to masonry, exterior insulation to masonry. For keyed exterior doors. Both knobs lock or unlock by key outside or turnbutton inside. Features titanium alloy throwbolt core and ultra-strike for jamb brace. "SmartKey's" patented side locking bar technology replaces the traditional pin-and-tumbler design. This design includes "BumpGuard" for improved security against lock bumping. "SmartKey" allows lock to be rekeyed without removing it from door. DOOR PREP: 2-1/8" Cross Bore, 1" Edge Bore, 1" x 2-1/4" Latch Face. BACKSET: 2-3/8" - 2-3/4" adjustable. DOOR THICKNESS: 1-3/4" doors standard and 2-1/4" doors optional. CYLINDER: 5 pin SmartKey. 5-pin optional. FACEPLATES: 1" x 2-1/4" round corner. STRIKE: 2-1/4" full lip. BOLT: 1" throw. Nickel plated. HANDING: Reversible for right or left hand doors. ANSI/BHMA: Grade 2. Commercial, Tubular Grade 2, entry knob, Series 4000, US32D Satin Stainless Steel finish, complies with ANSI A156.2, 400,00 cycles, non-handed, for use on interior or exterior wood or metal doors, 1-3/8" to 1-3/4" thick, latch - 1" x 2-1/4", square corner, 3/4" housing diameter, 1/2" Throw, backset adjustable for 2-3/8" to 2-3/4" strike, 1-1/8" x 2-3/4" x 3/32" T Strike; use 2-1/8" diameter hole for knob and 1" diameter hole for latch bolt; fits standard 161 Door Prep, Schlage C Keyway, UL Listed for 3 Hour fire door; includes 2 nickel silver keys. Secure attachment to concrete, block and brick. One piece design requires no assembly, does not require anchor torque-down, cracked and seismic approved. Blue ClimaSeal adds corrosion resistance. ANSI drill bit required. For keyed exterior doors. Both knobs lock or unlock by key outside or turnbutton inside. Features titanium alloy throwbolt core, anti-pick 6 pin system and ultra-strike for jamb brace. DOOR PREP: 2-1/8" Cross Bore, 1" Edge Bore, 1" x 2-1/4" Latch Face. BACKSET: 2-3/8" - 2-3/4" adjustable. DOOR THICKNESS: 1-3/4" doors standard and 2-1/4" doors optional. CYLINDER: 5-pin. FACEPLATES: 1" x 2-1/4" round corner. STRIKE: 2-1/4" full lip. BOLT: 1" throw. Nickel plated. HANDING: Reversible for right or left hand doors. ANSI/BHMA: Grade 2. For use on exterior mobile home doors where key locking is desired. Turnbutton from interior or key from exterior will lock or unlock both knobs. Full Lip 1/4" Radius, 2- pcs Nickel Finish Brass Key (KW1 5-pin), For keyed exterior doors. Both knobs lock and unlock by key outside or turnbutton inside. DOOR THICKNESS: Fits 1-3/8" to 1-3/4" doors. BACKSET: Adjustable 2-3/8" to 2-3/4". STRIKES: Full lip 1/4" radius. For keyed exterior doors. Both levers lock or unlock by key outside or turnbutton inside. Maximum Security locksets feature 2x strength full 1" throwbolt maximum security strike, and free-spinning guard. DOOR PREP: 2-1/8" Cross Bore, 1" Edge Bore, 1" x 2-1/4" Latch Face. BACKSET: 2-3/8" standard, 2-3/4" optional. DOOR THICKNESS: 1-3/8" to 1-3/4". CYLINDER: 5-pin. FACEPLATE: 1" x 2-1/4" round corner. STRIKES: 2-1/4" full lip round corner. BOLT: 1/2" throw. HANDING: Non-handed. ANSI/BHMA: Grade 3. For keyed exterior doors. Both knobs lock or unlock by key outside or turnbutton inside. Features titanium alloy throwbolt core and ultra-strike for jamb brace. "SmartKey's" patented side locking bar technology replaces the traditional pin-and-tumbler design. This design includes "BumpGuard" for improved security against lock bumping. "SmartKey" allows lock to be rekeyed without removing it from door. DOOR PREP: 2-1/8" Cross Bore, 1" Edge Bore, 1" x 2-1/4" Latch Face. BACKSET: 2-3/8" - 2-3/4" adjustable. DOOR THICKNESS: 1-3/4" doors standard and 2-1/4" doors optional. CYLINDER: 5 pin SmartKey. 5-pin optional. FACEPLATES: 1" x 2-1/4" round corner. STRIKE: 2-1/4" full lip. BOLT: 1" throw. Nickel plated. HANDING: Reversible for right or left hand doors. ANSI/BHMA: Grade 2. Hardened steel, diamond point. Designed for quick, secure fastening for a variety of jobs in poured concrete, brick and cinder block/masonry. Diamond point provides self-threading, maximum holding power for fastening conduit clips, furring strips, junction boxes, expansion joints, wall partitions/insulation, stud track, window/door frames, duct strap, gutters, joist hangers, shelves, signs and cabinets. For keyed exterior doors. Both knobs lock and unlock by key outside or turnbutton inside. DOOR THICKNESS: Fits 1-3/8" to 1-3/4" doors. BACKSET: Adjustable 2-3/8" to 2-3/4". STRIKES: Full lip 1/4" radius. Midwest Toggle Bolt, Round Head, 3/16 in Anchor, 4 in Anchor, Drill Bit Size 1/2 in, Zinc Plated, With Wings For residential single and multi-family entrance doors. Unlocked or locked by keyed knob outside or turnbutton knob inside; emergency exit feature, no unlocking required for panic exit, inside knob always unlocked. 1 piece knob for increased security. Solid brass trim and all metal parts. Wrought brass exposed trim. Pressure cast zinc tubular lock housing. Key removable outside knob for easy cylinder replacement. 3 piece assembly. All locksets have the same finish for both interior and exterior parts. DOOR PREP: 2-1/8" crossbore; 7/8" or 1" edge bore; 1" x 2-1/4" latch face, 1/2" throw standard. DOOR THICKNESS: 1-3/8" to 1-3/4". CYLINDER: 5-pin tumbler C keyway with nickel silver keys (2). FACEPLATE: 1" x 2-1/4". STRIKES: Full lip, 1-5/8" x 2-1/4", no box. BOLT: 7/8" housing and 1" throw. ANSI/BHMA A156.2-2011 Commercial Grade 2, ANSI/BHMA A156.39-2015 Residential Grade AAA and avaliable UL Listed for 3-hour fire door. LATCH: 1" x 2-1/4", 1/4" radius corner faceplate, 7/8" housing diameter, 1/2" throw, circular drive-in included, universal latch. BACKSET: Dual backset latches, fits either 2-3/8" or 2-3/4" backsets.